Before 1910: Denon is born as Nippon Chikuonki Shokai (Japan Recorders Corporation), founded by Frederick Whitney Horn. Horn was an American salesman, since 1896 involved in the import of tools (and machines) to Yokohama. He was also importing gramophones. To stabilize the spread of gramophone production and disc standards, and standardize those, he founded Japan-U.S. Recorders Manufacturing in 1907 and in 1909 he opened a factory producing discs. At the same time he opened a recording studio, to be able to control the whole process. 1910: In this year Horn started to sell gramophones, equipped with speakers in a characteristic shape of a wine bottle. In the same year he founded the Japan Recorders Corporation, predecessor of Nippon Columbia. This organization was to supervise the sales of records. In 1912 Japan Recorders Corporation merged with Japan-U.S. Recorders Manufacturing, starting double activities, with separate management of both departments. For the first time the name Columbia appeared in the name, when the company was capitalized. In 1927 the new official name is announced: Japan Columbia Recorders. 1928: The Columbia logo, we know today, emerges. In 1947 the company changes its name to Nippon Columbia, and in 1947, after absorbing Japan DENki Onkyo, it slowly becomes what we know today: DEN-ON. 1939: The official date of foundation of the company DENON. Japan Denki Onkyo, being named earlier Den-on was a group of engineers engaged in the manufacturing of radio's, originating from the times of Japan Electric Recorders Mfg. From 1939 Denon was specializing in producing gramophones, pick-ups and tape recorders. 1960: Relaxation of the bounds between Den-On and Nippon Columbia. 1962: Official date of birth of the DL-103 pick-up. It is worth to mention, that the origins of the cartridge we know today as the DL-103, reach times before separation of Den-on and Nippon Columbia. The research was conducted earlier, together with the research division of the television corporation NHK, and they were finalized in the year those two companies merged. 1974: DL 103 S – 8cu, elliptical needle, VTF 1.8 +/- 0.3grams – 27 000Yen..
1977: DL 103 D – the best model of the 70'. Internal impedance: 33Ω, 0.25mV, 12cu, elliptical needle point – 35 000Yen. 1978: DL 103 T – with adjusting transformer – 29 000Yen. 1981: DL 103 U – mounted in Denon head – 21 000Yen. 1982: DL 103 Gold – gold plated version of the standard DL-103 – manufactured on the occasion of the 20. anniversary of the cartridge– 21 000Yen. 1983: DL 103 M – light, aluminum body, output 0.12mV, impedance 40Ω, cantilever from boron , elliptical needle, 13cu, VTF 1,4 +/- 0.2g – 27 000 Yen. 1985: DL 103 LC / 1986 : DL 103 LC II – coil wound with LCOFC copper, 13Ω, output 0.25mV, spherical needle, susceptibility 5cu, VTF 2,5 +/- 0,3g – 20 000 / 21000 Yen. 1989: DL 103 SL (Special) – 6N 99.9999 Pure Copper, special, white body, specification the same as DL 103 LC / LC II, but with internal impedance – 14Ω – 30 000 Yen. 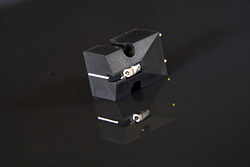 1990: DL 103 GL (Gold Limited) – special, black body, output 0.25mV, 40Ω, spherical needle, 5cu, VTF 2.5 +/- 0.3g, coil 4N High Purity Gold Wire 99.99%, limited production in year 2000 – 50 000 Yen. 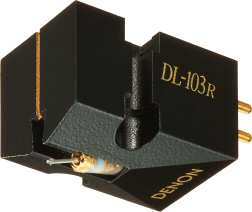 1991: DL 103 C1 – coil LCOFC, special, black body, output 0.25mV, 14Ω, spherical needle, 5cu, VTF 2.5 +/- 0.3 g – 32 000 Yen. 1993: DL 103 FL (Fan Limited) – special white body, output 0.28mV, 30Ω, spherical needle, 5cu, VTF 2.5 +/- 0.3 g – 40 000 Yen. 1994: DL 103 R – specification the same as DL 103 SL (special), but in a standard black body with little gloss – 28 000 Yen. DL 103 Pro – 0.35mV, 38 Ω, 6cu, spherical needle, VTF 2.0 +/- 0.2g. Modified by the company Highphonic – 35 000 Yen. 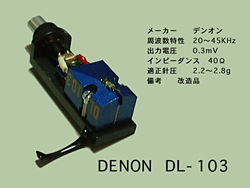 2006: DL-103 EN – specification not yet known, 70 000 Yen.. 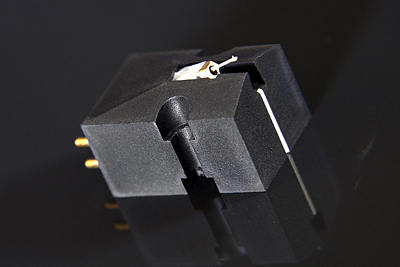 The Denon cartridge is really incredible. When the distributor send me the first information about the price (415zł), I thought, he list a 1 in front of it. The issue was clarified, but the listening session posed another question mark. It is not a good habit to announce that something is sounding better, than something else at twice the price, or announcing another leader with lather on the mouth. But from time to time I catch myself doing just that, anyway. The only explanation and excuse I have, is that the tested devices are good things, those that passed the initial selection. The same is with the DL-103. I will say it even if you feel disgust: this cartridge sounds in most aspects as three times more expensive products, like the Blackbird Sumiko (test HERE). Not fully, there are things that show substantial progress of the technology, but the overall impression is just like that. Well, the confession is behind me. So let us say something concrete (in our business there are sometimes problems with that...). Despite the spherical needle point, so not well fitted to the shape of the disc groove, we get an incredibly competent, full of meanings and shades sound. Rich, one could say. We have a nice, resonant treble as well as strong bass. Especially well sounding was the contrabass from the disc Girl Talk (TBM/Cisco, TBM-2559-45, 45rpm Special Edition, 180 g 2LP, #0080) Yama&Jiro’s Wave (from the Tsuishi Yamamoto Trio). It was well articulated, strong, and had a well drawn, transparent upper range. Completely brilliant was the reproduction of the piano, many times played with full strength in the upper octave. Those fragments showed, that the tracking is very good – the 2.5g pressure helps there – but with the more dynamic fragments with prominent midrange, it happened sometimes that the sound was a bit “cooked”. Not much, but it could be heard. The pick-up, obviously, is not fully transparent – between us and the performer, even on such superbly recorded disc, there is always muslin veil. On the other hand, the veil has the same thickness as with 1200-1400zł costing pick-ups. In addition, despite this, the communication reproduced by it is better, more believable. As it seems, most probably it is about a kind of consistency, stability – yes, stability is the best word. The sound has a clearly defined boundaries, it is filled and shown as a whole. The treble and midrange are very smooth, maybe without a catching amount of details. Blackbird shows more of them, but the Denon unveils a very good whole in front of us, integrating the separate sounds at least as well as, or maybe even better than the EVO III Sumiko (test HERE). The voice of David Roth from another brilliant disc – Pearl Diver (Stockfish, SFR 357.8031.1, Direct Metal Master, 180g LP) was exactly in front of us, had a large volume and was very good separated from the rest of the instruments. Here also the incredible coherence of sound could be noticed, outstanding smoothness, fluidity of the midrange and treble, that never sounded unpleasant, or sharp. Another “black pearl”, the record of Madeleine Peyroux - Careless Love (Rounder/Mobile Fidelity, MFSL 1-284, 180g LP) – and the same again: big, warm voice, with nice articulation and open, resonant instruments behind it and to the sides of it. The closer to the first plane, the better defined in the details, and always very well presented in timbre. If I was to define the boundaries, that – in one way and another – mark the area of reach of the DL-103 pickup, I would call on the not fully satisfying transmission of the details of the timbre of the instruments, especially behind the first plane, and the not fully coherent bass. As to the minuteness, the good, very good timbre, help to large extent, in not noticing that, because the instruments are not discriminated by the edges, borders, but by differences in timbre, but it must be said, that the resolution is only good. Also the lower bass, only good controlled, without a rigid attack, is limited by the resolution of the whole setup. But these are only details. The biggest problem might be the ... listener. 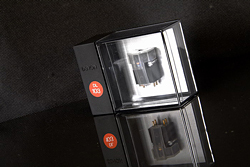 Choosing a cartridge for less than 500 PLN, it will be paired with an equally inexpensive preamplifier. And that is a big mistake. Even the constructions costing 4000zł will not be good enough. 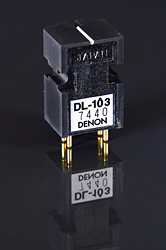 A problem will be the fact, that the Denon is a MC pick-up, and this is the Achilles heel of all cheap preamplifiers. And surprisingly – the best solution is to buy a Denon amplifier – all are equipped with gramophone preamplifiers MODIFIED FOR USE WITH THE DL-103! And they sound with it very good – all each as good as the main device, but in every case at least good. However if we measure up to buy a cartridge and a preamplifier and we have a 2000zł budget, the best proposition will be the Denon for 400 and a preamplifier for 1600 PLN, better than a 50/50 split with another pick-up.